Niagara Falls, NY - Shoppers line up for the trendy fashions at H&M that opened on Thursday at the Fashion Outlets of Niagara Falls, USA. 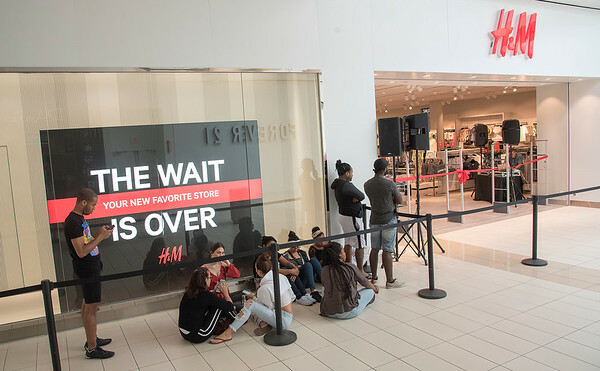 NIAGARA FALLS, NY(Aug. 1, 2018) – Fashion Outlets of Niagara Falls, USA today announced that H&M will open its doors to shoppers at 12 p.m. on Thursday, Aug. 2. The grand opening kicks off the start of back-t0-school shopping season at Fashion Outlets of Niagara Falls. The new H&M location, which measures approximately 21,000 square-feet, will offer shoppers a one-stop shop for quality clothing. The store offers clothing and accessories at the best price in a sustainable way, with collections for ladies and men and a separate “shop in shop” section for accessories. The location will also carry the H&M Kids collection for newborns to 14 year olds. To celebrate the new store, customers at the H&M location at Fashion Outlets of Niagara Falls can line up before noon on Aug. 2 for a chance to win an H&M Fashion Pass valued at up to $500, while supplies last, in addition to other surprises for the whole family. H&M values sustainability and practices a garment collecting initiative, which allows customers to drop unwanted textiles at an H&M store and receive a voucher. Customers who participate in garment collecting on opening day can enter to win a gift card from $50 to $250 dollars. To gear up for the new school year, now through Sept. 3 Fashion Outlets of Niagara Falls will be running a school supply donation drive to help gather supplies needed for the children of the Niagara Falls Boys & Girls Club. Together, the two organizations will work to provide backpacks filled with supplies to the children of the Niagara Falls Boys & Girls Club programs. When shoppers drop off donations to Fashion Outlets’ guest services desk, they will receive afree savings pass ($5 value), a free Applebee’s appetizer coupon ($9 value), a free tea of the day from DAVIDsTEA, and special retailer coupons (based on availability). Fashion Outlets of Niagara Falls USA is a top-performing indoor outlet destination offering the best outlet shopping experience at a value, conveniently located just minutes from Niagara Falls, the Canadian border, and local hotels and casinos. The 700,000 square-foot property located in Niagara Falls, New York, is owned and managed by Macerich. For additional information, please visit ourwebsite, like us onFacebook, or follow us on Twitter and Instagram at@FashionNiagara.